From first sight, Wesley House captures the imagination. 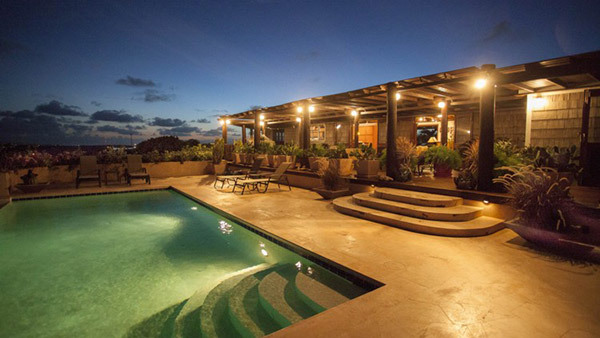 Under wood pergolas, laced with vines and Bougainvillea, with twinkling lights above and the Caribbean sky beyond, a certain magic lies within this Anguilla villa rental. 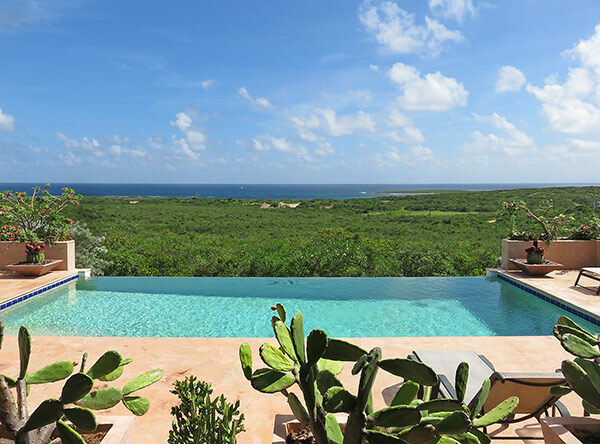 Here, the Caribbean Sea breeze washes in through open windows, an infinity edge pool gazes out to remote Savannah Bay and lush landscaping lends beautiful aromas to the property. 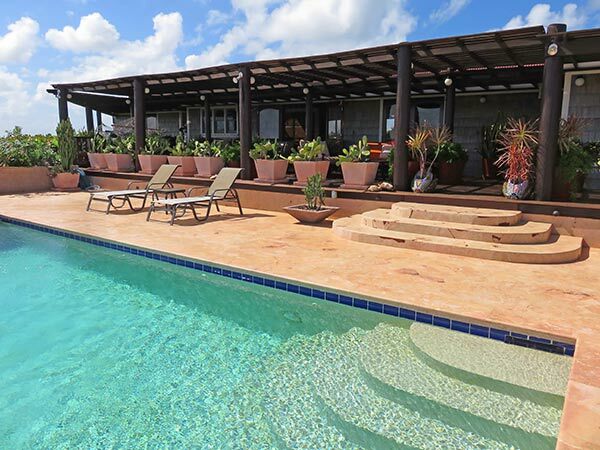 A completely unique type of villa, Wesley House truly captures the essence of Anguilla. A single story house, its design is distinct. Wesley House fuses a Caribbean layout with touches reminiscent of a Cape Cod beach house (for example, its grey shingle clad exterior). 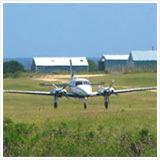 Its layout emphasizes the island's natural beauty. 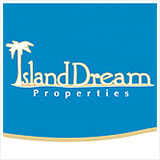 The first indication is the property's landscaping. Wesley House's owners have put great care and passion into their gardens. 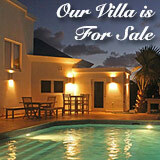 The villa is surrounded by manicured hedges and carefully placed palms. 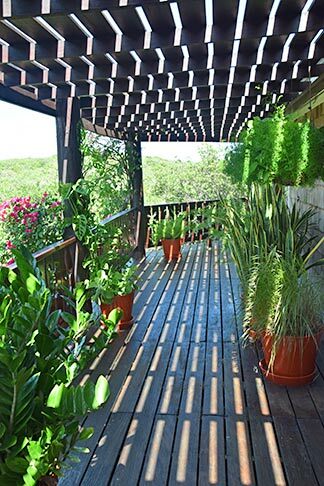 Potted plants of all species line the front deck. Flowers in bloom, it is a beautiful introduction to your "home away from home." The feeling is undeniably tropical. 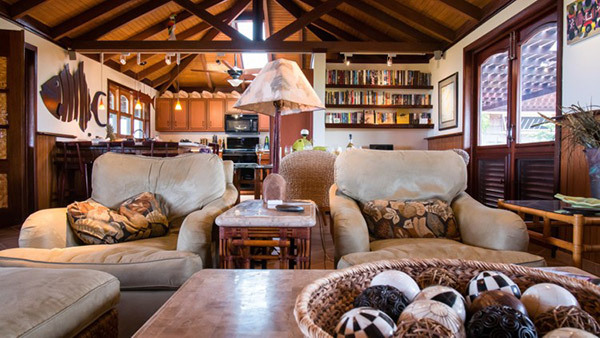 With wood underfoot and pergolas overhead, the villa exudes a Caribbean feel. 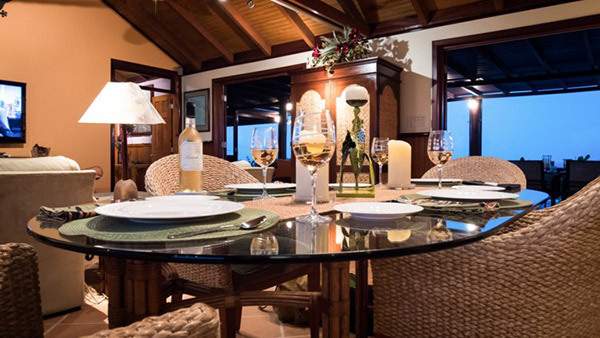 Through the villa's grand front doors and you are inside Wesley House's spacious living, dining and kitchen area. 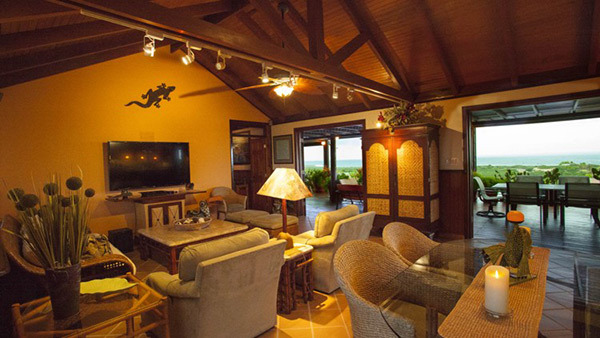 Facing south east to Savannah Bay, the room opens onto the villa's grand deck. 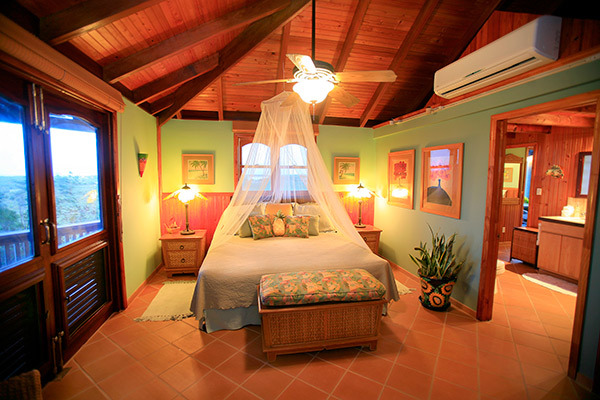 Leave the doors open and a cooling Caribbean breeze blows through. You will never overheat at Wesley House. Warm hues and tones and tropical art pieces create an exotic feeling, almost reminiscent of a South African lodge. The living room comes complete with a home theater with surround sound and a 50" flat screen TV. 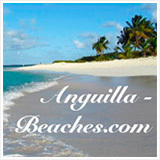 Cable, DVD, a video library as well as a library of books are all available. A dining table with rattan chairs sits in the middle of the living, kitchen, dining area. 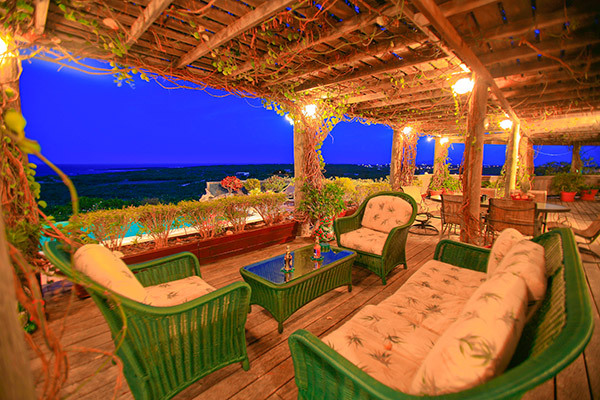 Set in the breezeway, the villa's terrace is just a few feet away and Savannah Bay lies in the distance. A small desk, with computer, printer and WiFi is tucked just behind the dining area. 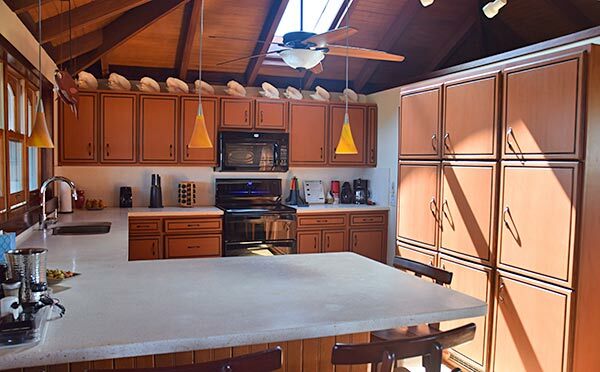 The dining space leads into the villa's gourmet kitchen. Custom-made cabinetry artfully disguises the villa's oversized fridge and freezer. 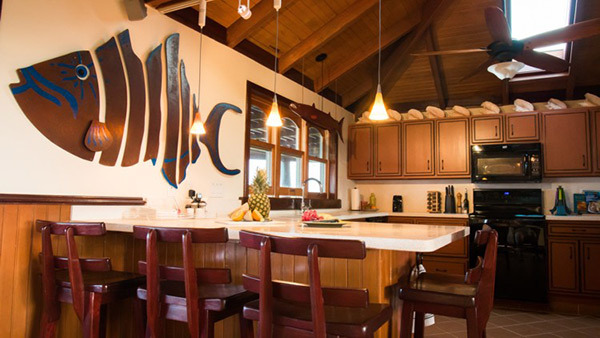 Charming art pieces dot the kitchen, enhancing the villa's Caribbean feel. The signature Wesley House iron fish adorns the wall and a hand-carved wooden fish (see middle of photo above) hangs above the sink. Carved by the villa's owner Ted, it is lined with mini-lights and serves as additional lighting. A beautiful creation. When it comes to cooking, every chef is in heaven at Wesley House. 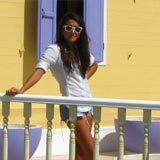 Ted's wife, Cheri is a passionate cook and has outfitted her kitchen with every gadget under the sun. Wine fridge, bread maker, pasta maker. That just scratches the surface. Cheri also keeps her kitchen well-stocked with all of the essentials so you can get cooking quickly. There is no need to buy unnecessary large quantities of spices and sauces. Cheri's kitchen has you covered. Flanking the living, dining and kitchen area is Wesley House's master bedroom and bathroom. 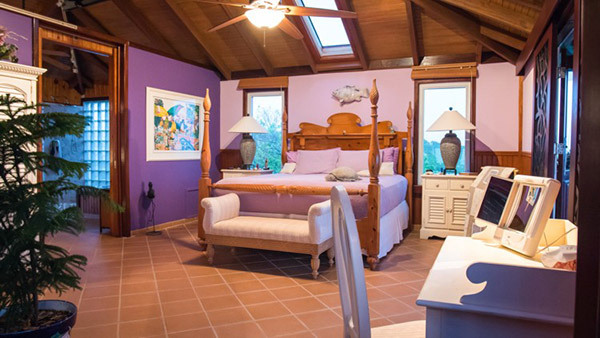 Dressed in purples, the oversized room's location is idyllic. 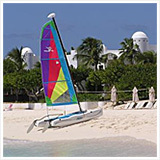 It captures Anguilla's soothing tradewinds. 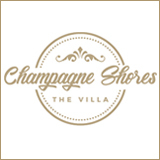 Although all the villa's bedrooms have air conditioning, there is no need for it. 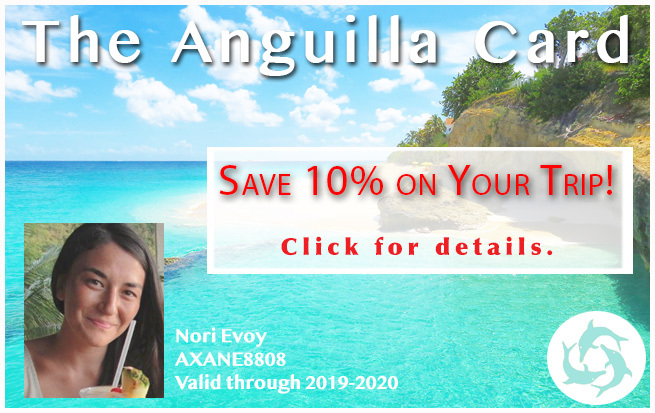 Breathe in 100% natural fresh air. 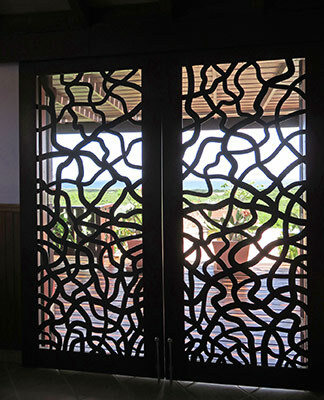 Ted and Cheri have really thought of it all, even installing a heavy iron door that opens onto the terrace. The door lets the breeze blow through while you sleep easy. The master bedroom backs onto a spacious master bathroom. Paneled in wood, Ted and Cheri have thought of everything here, too. 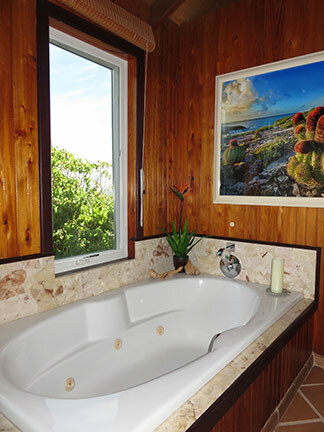 The bathroom is complete with an oversized tub for long soaks and a walk-in glass block shower. 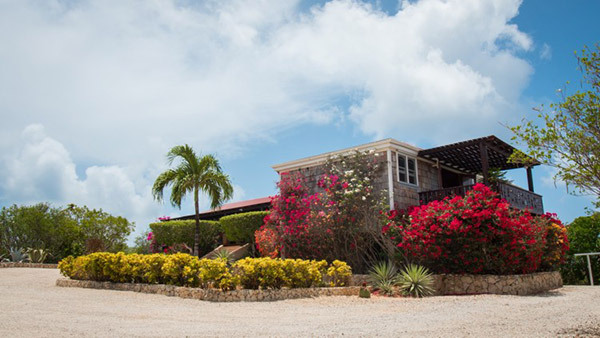 You can rent Wesley House as a one bedroom villa (the main part of the villa houses the kitchen, living, dining area and the master bedroom) or as a two or three bedroom villa. The two additional bedrooms are set in a separate building, just across from the kitchen's back door. 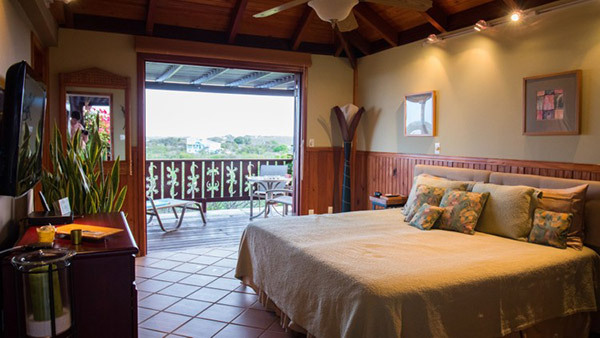 The second bedroom looks out to the same stunning view of green valleys, the deep blues of Savannah Bay and the open ocean beyond. Comfortable and cozy, the bedroom has its own flat screen TV with cable TV and DVD player, as well as an ensuite bathroom. 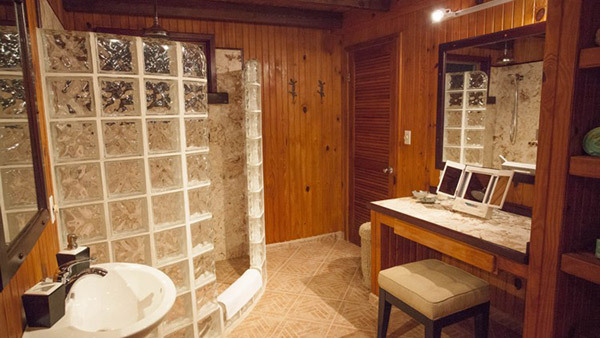 With a spacious shower, these bathrooms have everything you need, including hair dryer, soaps, shampoos and conditioners. Ted and Cheri remove the need to have to over-pack and check luggage for liquids. The third bedroom is set behind the second bedroom. 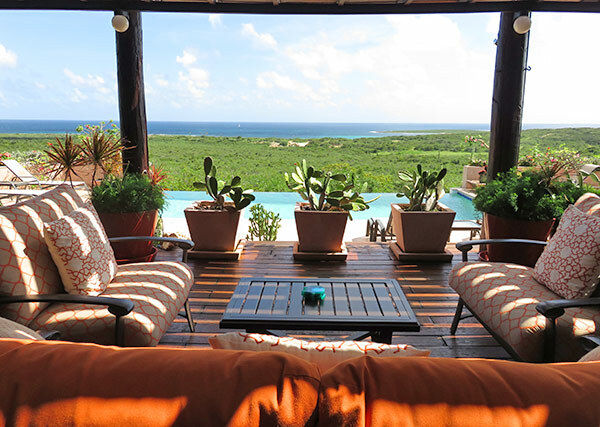 Its private terrace looks out to the south side of Anguilla and The Valley. The bed can be made as a king or as two twins, making it the room of choice if you are traveling with your children. Similar to the second bedroom, this bedroom, too, has its own flatscreen TV with cable and DVD player and its own bathroom with shower and vanity. Wesley House lays out perfectly for multi-generation families traveling together, or families traveling with older children. 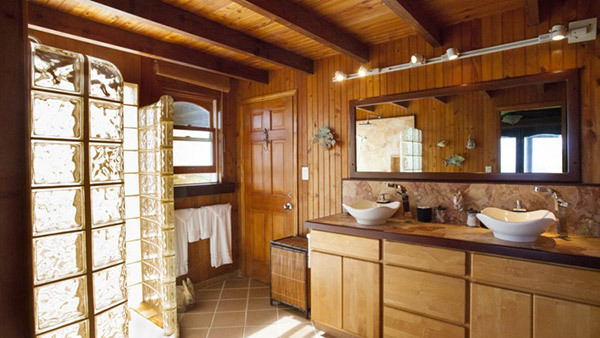 The addition of bathrooms in each bedroom adds to your privacy. 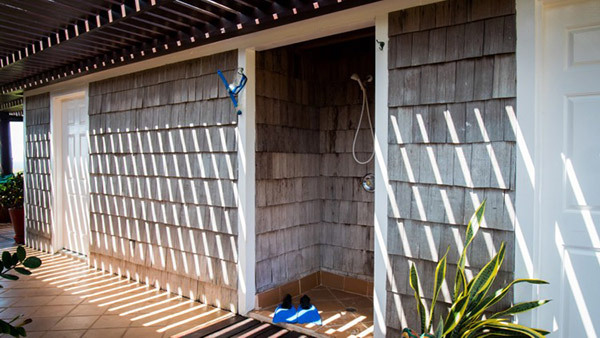 Outside of the villa's two separate bedrooms, and on your way to the villa's terrace, is a charming outdoor shower. A smart touch for a quick rinse off after a trip to the beach. This terrace goes beyond "oversized." It runs the entire length of the house, thoughtfully shaded by an expansive pergola. Two of the three bedrooms and the kitchen, living, dining area all open onto this gem of a spot. 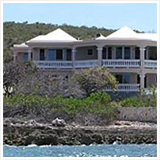 This is one villa that is geared to outdoor living and enjoying the vast scenery found on the east side of Anguilla. Standing on this deck and taking in the views, you realize how special Wesley House is for its location alone. 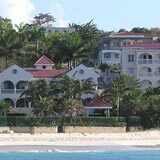 It is one of the only Anguilla villa rentals that looks out to Savannah Bay's long, windswept stretch as well as the coastline that extends to Windward Point. 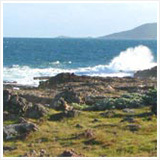 With clear views to the sea, the setting is remote and free. The terrace itself has plenty of seating areas and dining areas. 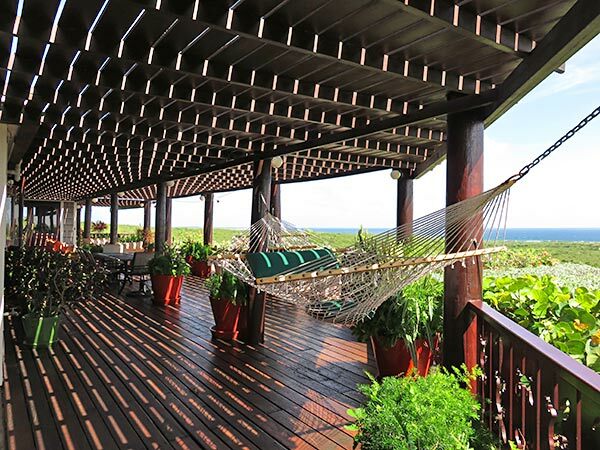 With hammocks, outdoor couches, dining tables and chairs, space to kick back and relax is well afforded. 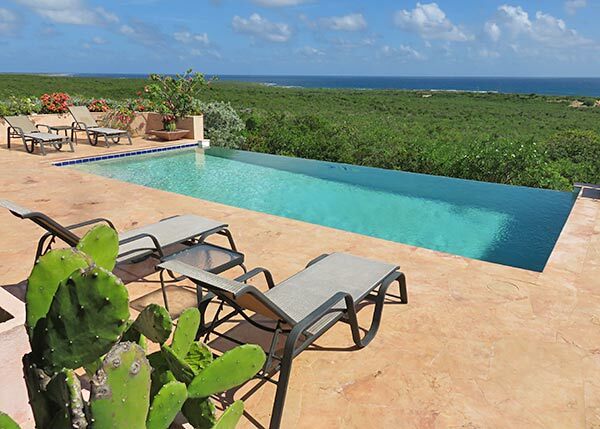 Set down one level, the infinity edge pool basks in the hot Caribbean sun. Cool off as you take in the stunning contrast of blue-green-blue. Surrounded by cacti and plants, it is nothing short of serene. 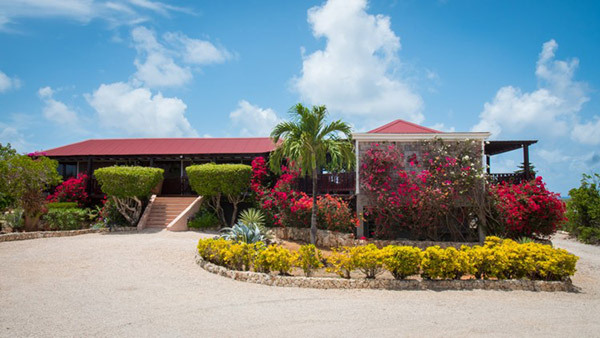 Wesley House delivers a unique Caribbean villa experience that lets you embrace Anguilla's natural beauty.